Every air traveler knows the feeling. You have made it to the airport, been through security, boarded the plane, and are sitting in your seat. The aircraft inches its way toward the runway, you hear the engine rev, and you are filled with anticipation. And bam! It races down the tarmac and takes to the sky. You are on your way, you are flying! 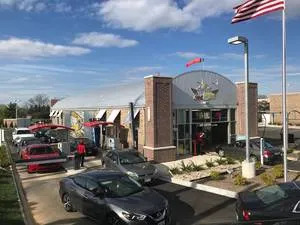 In just five short years Flying Ace Express Car Wash has gone from industry newcomer, to thriving mini chain with three locations in the Dayton, OH market. But that is just the beginning. The wash has three more locations in development that will open their hangar doors this year, doubling its holdings and taking the business soaring to new heights. 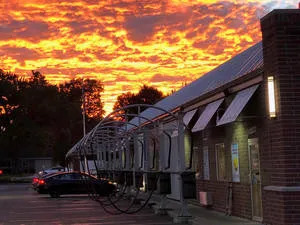 Eight years ago, Dayton native Dan Eisenhauer discovered Moo Moo Express Car Wash based in and around Columbus, OH, and he was intrigued. He had never experienced the express concept before and was struck by its efficiency and saw immediate potential for a similar business in Dayton. 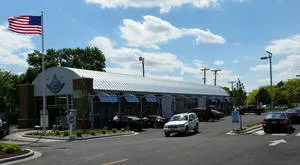 In fact, Eisenhauer was so captivated that he reached out to one of Moo Moo’s partners and general contractor John Roush to ask him if he would be interested in building similarly equipped express washes in Dayton. He was. 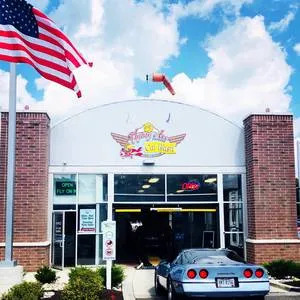 The two founded Flying Ace Express along with partner Jeff Gilger in February of 2014 and opened their first wash a year later. Dayton is all about flight, and the partners played off its strong aviation heritage when designing their express wash. 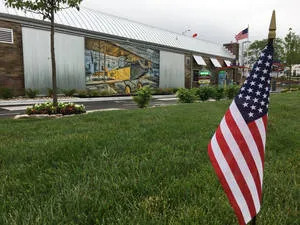 The city is the birthplace of the Wright Brothers and home to the Wright-Patterson Air Force Base. The partners used that aviation obsession to build the look and feel of their express concept. The unique look and feel of Flying Ace, coupled with the introduction of the express concept into the market helped the wash instantly connect with Dayton car washers, allowing it to scale from one to three washes very quickly. 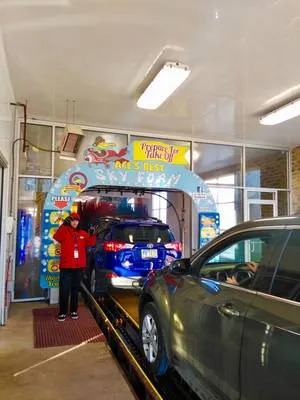 The popularity of the unlimited wash club has given the partners the confidence to double the number of Flying Ace washes in the Dayton market. But the rapid expansion would not have been possible without a realignment of the ownership structure. 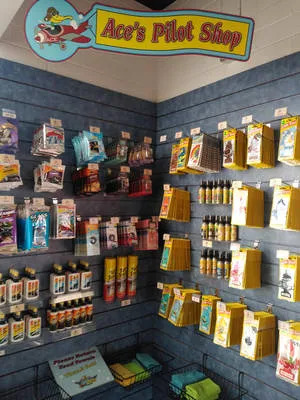 The lobby store features car care essentials. In April of 2018, Flying Ace’s founders, backed by a strategic partnership with Wildcat Capital Management, bought out Roush’s partners in Moo Moo Express. 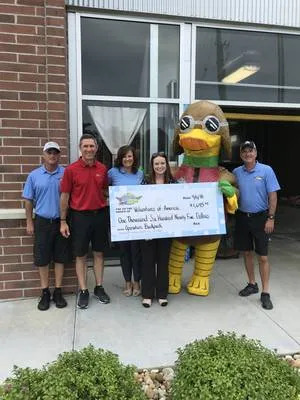 The newly formed parent company, Express Wash Concepts, now owns both Flying Ace and Moo Moo, with Roush, Eisenhauer, and Gilger operating both chains. With the two chains now under a common ownership, the parent company can bring its full force to bear to continue to expand the two brands. Before the end of the year Flying Ace will have six washes operating in the Dayton market. Moo Moo will simultaneously expand its holdings from 15 to as many as 18 before 2020 lands. A loyal customer base is vital for such rapid expansion to be successful. Flying Ace has built a strong community presence thanks to its commitment to fundraising and relationship building. A key cornerstone of its community involvement is its charity wash program. make it safely onto the conveyor. Flying Ace has partnered with local drive-time radio disc jockey Frye Guy to promote its charity events. Every other month the wash picks a local charity and does an onsite remote with Frye Guy live on the radio. All of the proceeds from the two-hour event are donated to the charity organization. “The charities will typically send down a representative and they will be on the live remote,” Eisenhauer says. “We are there as well walking the lot, talking to customers, letting them know we have free food and what the fundraising is going toward. In addition to its hosted charity events, each wash is given a $2,500 budget annually to support a local charity of its choice. The money can be used to sponsor a local sports team, put a banner up at the high school, anything the wash and its employees decide. Fundraising is a major part to Flying Ace’s success. The jet-powered airliner that is Flying Ace Express is accelerating down the runway poised for takeoff. Its engines are powered by a strong community presence and a commitment to providing a differentiated and consistent customer experience. Over the next few years it will continue to gain altitude as it adds more locations to its growing roster of washes. A beautiful mural pays homage to Dayton’s aviation roots. testAll content copyright © 2019 EW Williams Publications Company. All rights reserved. No reproduction, transmission or display is permitted without the written permissions of the publisher.